Faculty members from Stephen F. Austin State University's Arthur Temple College of Forestry and Agriculture spent a week touring China's Jilin province as guests of the Jilin Provincial Academy of Forestry Science as part of a developing partnership between SFA and the institution. Pictured at right, Dr. Jianqiu Zhang, director of the academy, discusses research conducted by his team, as SFA faculty members Dr. Yuhui Weng, assistant professor of forest biometrics; Dr. Kenneth Farrish, director of the Division of Environmental Science; Dr. Hans Williams, dean of the Arthur Temple College of Forestry and Agriculture, and Dr. Brian Oswald, Joe C. Denman Distinguished Professor of fire ecology, look on. 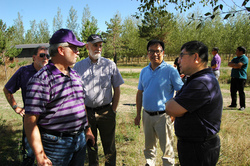 NACOGDOCHES, Texas - Faculty members within Stephen F. Austin State University's Arthur Temple College of Forestry and Agriculture spent a week in June touring China's Jilin province as guests of the Jilin Provincial Academy of Forestry Science. The purpose of the trip, attended by SFA faculty members Dr. Hans Williams, dean of the Arthur Temple College of Forestry and Agriculture; Dr. Kenneth Farrish, director of the Division of Environmental Science; Dr. Shiyou Li, director of the National Center for Pharmaceutical Crops; Dr. Brian Oswald, Joe C. Denman Distinguished Professor of fire ecology; Dr. Jeremy Stovall, associate professor of silviculture, and Dr. Yuhui Weng, assistant professor of forest biometrics, was manifold and included discussions regarding research partnership and scientists exchanges. Williams said the two institutions plan to focus on research collaborations that address forest ecology, silviculture, tree physiology and tree genetics. "In Baicheng, we observed an impressive public park in the middle of the city that served as forestry demonstration and research plots," Williams said. "It was an outstanding example of combining forestry science with public outreach." To learn more about this and other news, visit http://www.atcofa.sfasu.edu/.